Our process begins with consulting with you, our customer. Our landscape designer will meet you on site to discuss transforming your property and help sculpt your ideal design. 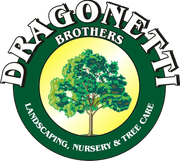 At Dragonetti Landscape we guarantee that your design will be personalized to satisfy each of our clients unique taste...read more. Once the design and estimate has been approved, we will start to plan for installation. The site will be cleared and graded as needed, providing a fresh canvas to begin work....read more. Once the rough grade has been established, the mechanical landscape aspects such as drainage and irrigation are installed. Hardscape features such as retaining walls, walkways, patios and sitting walls are constructed...read more. Owning and operating our own Garden Center and Nursery allows us to work with a wide variety of plants: evergreens, perennials, annuals, hardy shrubs, shade and ornamental trees, native plants, and anything else that you might want included...read more. Our team takes the next step in enhancing your garden with special features such as waterfalls, ponds, rooftop gardens and much more....read more. Every landscape installation requires maintenance to obtain its beauty, Your garden is a living environment and evolves with time....read more.